First, tell us a little about yourself & your family. While I've dabbled in many things (occupational therapist, doula (a birthing coach), part time medical school teaching assistant/proctor), my full time job for the past 13 years or so has been homemaker and mom (or mommy, depending on the child). Dave and I have been married for sixteen years and have four children, ages 13, 11, 8, and 3. With the exception of the 8 year old (she's a gymnastics girl) we're a serious soccer family. Most Saturdays will find us on the fields or traveling. In between we shuttle to practices or to school games. Dave and I have always had a heart for family ministry and for worship. We've recently become partners in and enjoy serving at Celebration Community Church, in Kissimmee, FL. Honestly, I can't say I ever wanted to be a writer. *I* always wanted to be a doctor. Writing has always come naturally to me, and I've actually had friends tell me over the years that I'd write a book "someday." What is so amazing to me about this whole process is that God's hand is so evident in it. Truly, it's not Heather's book — it's His. So why did you start writing in the first place? Shortly after the birth of my fourth child, I was feeling lonely and disillusioned. My long time homeschooling gal pals were sending their children to public school and returning to school and/or the workforce. Their lives seemed to be moving on, and mine seemed to be stuck--mostly at home with an infant who was chronically needy. A friend of mine had started a "mommy blog" and I enjoyed reading it (while rocking the baby). I thought, "Maybe I can do this, too..." Blogging became a way to process what was going on in my life; not quite as personal as a journal, but very encouraging as I could get feedback in the form of comments. What kinds of responses to the book have you gotten so far - excluding from your family, who simply LOVE it, of course! The responses I've heard have been overwhelmingly positive. My favorite comments have been women who have shared that God has used the book to encourage them, or that it's "just like you were sitting next to me, talking." Another favorite came from a person at my church. We'd worked together extensively, but never quite "clicked" relationally. After a book signing she shared that reading my book was like taking a peek inside my heart (!). Our relationship has improved tremendously since then. Just Enough Grace is divided into three sections - sort of three phases of your life. Let's take each section one at a time. The first section is "Just Enough Grace for Children." What's one of your favorite entries from this section? I love "Mirror, Mirror, on the Wall" (p.16). It talks about how Christian women (including me) have a bad habit of placing our identity in the choices we make rather than in the One who saved us! It's just SO easy to fall back on a works-based mentality, or to think I'm more worthy of God's love if I...keep a perfect house, serve on this committee, or whatever. Some children are harder to raise than others! I thought I had the baby thing down until my youngest came along. He's STILL shaking things up at our house three years later. Seriously, I learned that I needed to extend grace to myself and to others who were struggling with not particularly enjoying a season of their lives. Let's face it; the early days of motherhood with a high need/special needs child are not the blissful time that baby product ads would lead us to believe! That season of my life also set me up to be okay with not being able to be the "Super Everymom"--the image that I had formerly projected. I learned to let things that didn't matter go a little. This was a lesson I really needed to learn before my cancer treatment began. What are your kids teaching you these days? Time management! My husband is working about 75 miles from home these days and is gone most of the time, so I'm the one coordinating all of the schedules for speech therapy, preschool, gymnastics, soccer, math club, drama, etc. We're also testing new parenting waters--we have a teenager as of last week. I'm learning to transition my parenting from the authoritative mode that I have to use for my younger children to the more relationally-governed mode that has to use with tweens and teens. It's quite a juggling act. More of this interview with author Heather Nations in a later post. 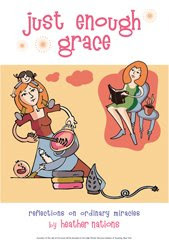 Remember: you can read an excerpt of Just Enough Grace on ACW Publications' website. It's also available for purchase directly from us or through Amazon.com.